After reaping the benefits of a full week of Double GTA$ opportunities in the Lowriders Custom Classics Event Week, take advantage of a huge array of discounts in-game now through to Thursday March 31st. As well as an exclusive unlock available all week and Double RP Race Playlists, there's up to 50% off clothing and tattoos, and 25% off select vehicles and more from the Ill-Gotten Gains Updates, Part I and Part II, not to mention discounts on select car modifications. "It's time to fight to the end. Again". Simply log-in to GTA Online any day this week and you will unlock an exclusive t-shirt bearing the name of Richards' Majestic cult classic sci-fi feature The Shoulder Of Orion II. If you complete the Playlist, and want to replay it to earn more Double RP there's no need to restart the game - you can find it again easily via the Rockstar Playlists section of the GTA Online pause menus. Hit the Legendary Motorsport website on your iFruit phone this week for solid discounts on select rides from the ILL-GOTTEN GAINS Update Part 2. Through the end of the month, buy the luxurious off-road beast that is the Coil Brawler, the lightning fast Progen T20, the Muscle classic Invetero Coquette BlackFin and the KERS-enabled Dinka Vindicator motorcycle - all at a 25% discount. 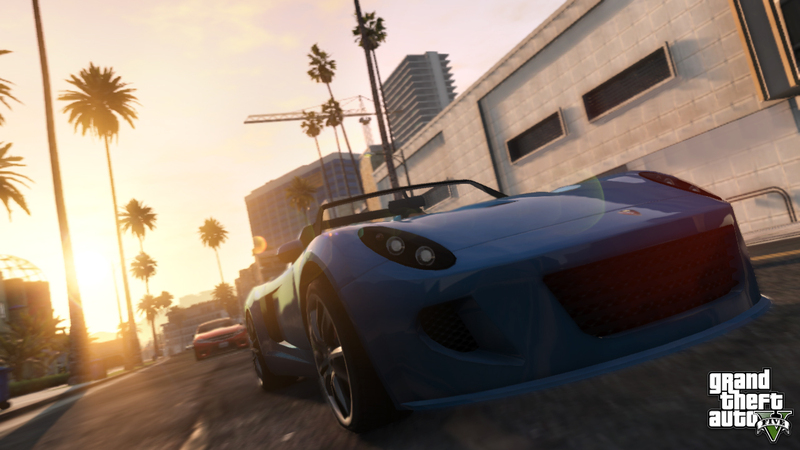 Modifications for these vehicles and many others will also be available with a quarter of the price taken off the top. Just roll on over to Los Santos Customs for the hook up! Not just by land, prices are also getting slashed at sea: the fine folks at DockTease are getting into the spirit of things with 25% off the Lampadati Toro, so pick up this luxurious, balls-out speedboat if you haven't already. Style your wardrobe, and body, at a good price all week long with 50% off all clothing and tattoos from both ILL-GOTTEN GAINS Updates. Swing over to Binco, Suburban or Ponsonbys to get the look you want in outfits including The Baller, The Swank and much, much more. While you're at it, let your body be the canvas without killing your bank account and get inked with any of the 30 ILL-GOTTEN tats at any parlor for half off too. Leave a lasting impression with any style of Knuckle Duster, from The Pimp to The Rock and everything in between for 50% off retail. Stop off at any Ammu-Nation outlet so you can knock suckers out in style. 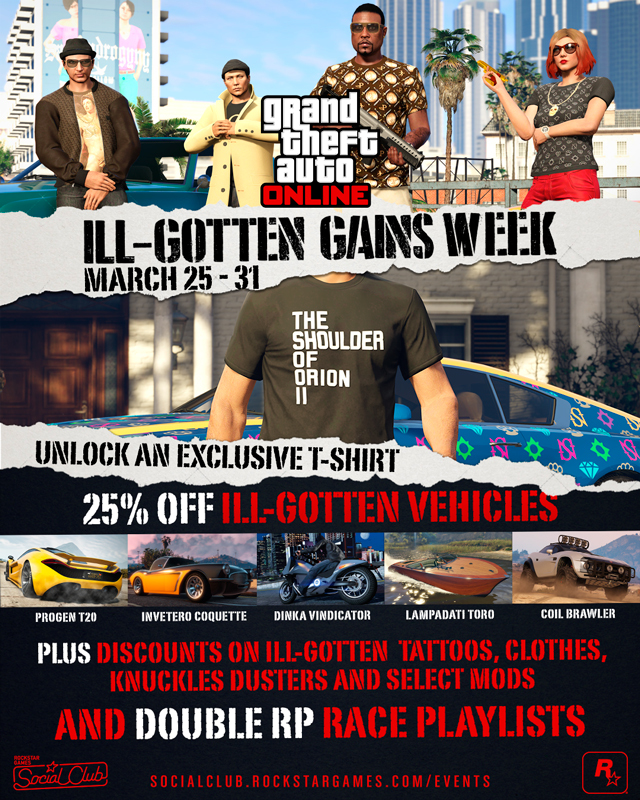 GTAO Ill-Gotten Gains Week - Another week of discounts and bonuses in GTA Online.